New York - January 20th, 2010 - Sumthing Else Music Works, through its licensing relationship with Microsoft Game Studios, proudly presents Halo Legends Original Soundtrack featuring the original music from the anime series Halo Legends composed by Tetsuya Takahashi (Sonic: Night of the Werehog, Resident Evil: Degeneration) and Yasuharu Takanashi (Genji: Dawn of the Samurai). 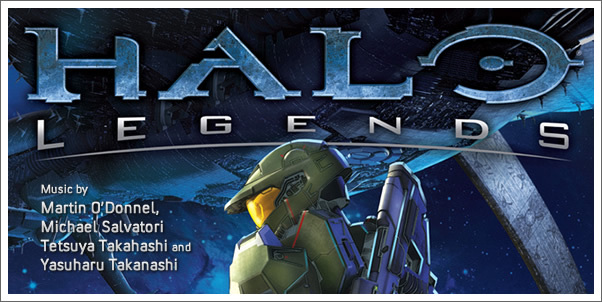 Presented by 343 Industries Halo Legends is an unprecedented gathering of the finest talent in Japanese animation that have drawn together to explore the mystery and action of the Halo universe. Halo Legends Original Soundtrack will be released on February 9th to retail outlets through Sumthing Else Music Works www.sumthing.com, and will be available for digital download on Sumthing Digital www.sumthingdigital.com and iTunes®. Created by some of the world's leading anime studios including Bones Inc., Casio Entertainment Inc., Production I.G, STUDIO4°C and Toei Animation, Halo Legends takes one of the most iconic franchises in science fiction and video games to an amazing new level; Eight episodes and a stunning range of visual styles shed new light and epic perspective on Halo lore. Halo Legends will be distributed by Warner Home Video on DVD, Blu-Ray and digital formats on Feb. 16, 2010. For more information on Halo Legends, please visit www.halolegends.com and www.halolegendsdvd.com.